1. 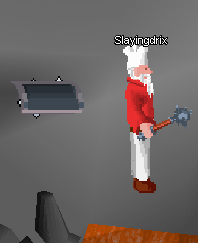 I CANNOT fight any monster that I am not on a slayer task for. This means no training combat stats on anything other than slayer tasks, and I must stop fighting whatever my slayer task was after the last one dies. 2. 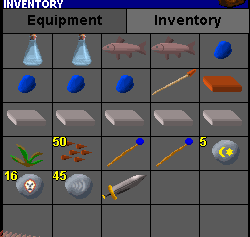 I CANNOT train gathering skills (fishing, woodcutting, mining, thieving), but I can train production skills if the items for them are dropped by slayer monsters. 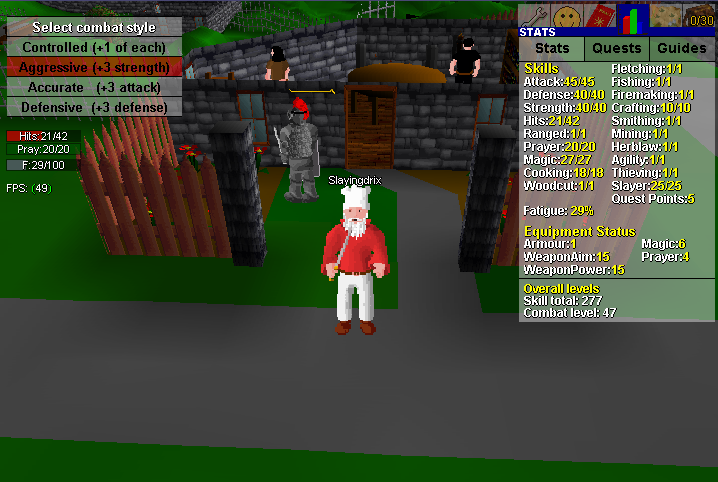 I can also train agility as much as I want, as it offers no benefit outside of quest requirements and shortcuts. 3. 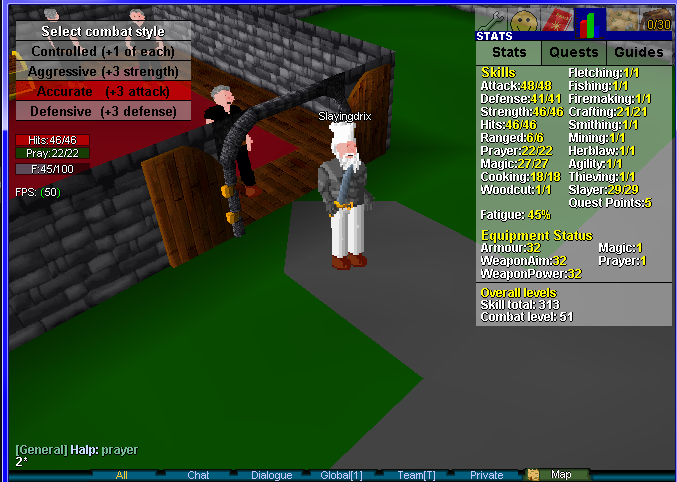 I CAN complete any quests that I can get the skills for, and will allow myself to fight whatever quest bosses that might include. 4. I CANNOT equip anything that wasn't dropped by a slayer monster. That means nothing from shops, nothing from quest rewards, and nothing I make myself. 5. I CAN kill monsters however I want, with ranged, magic or melee. For Ranged, I would have to get a bow drop and arrow drops, but since runes aren't "equipped", I think that magic will be a convenient exception. I won't be able to equip a staff unless one drops however. 6. I CANNOT pick up any inedible respawning items. This is to disallow money making methods like picking up steel platebodies and staves of earth in the wilderness. I can pick up things like cabbage, cookedmeat, or even the stews on the floor in underground pass if I make it that far, but nothing I can't immediately eat. This also restricts things like grain, that can technically be made into food, or anything raw that might respawn. 7. I CANNOT buy items from shops. 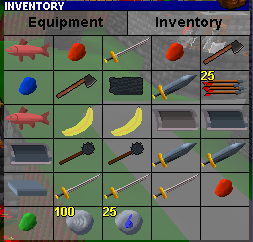 I don't think it's necessary to buy runes or food, so it seems like more fun to just cut out shop items entirely. I can still sell stuff though. Update #3: My next task was Unicorns, which is pretty easy, especially since there's one right next to the cookedmeat spawn in Barbarian village. I also was able to complete the mini-quest to kill 5 unicorns, which rewards you with 5 antipoison! These might come in handy at some point. My next task is exciting: Mud Golems! Finally, something that can drop actual gear. 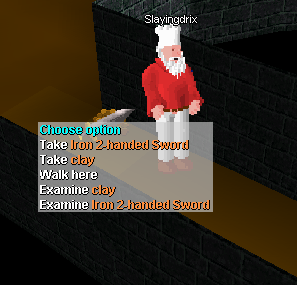 The best weapon I can hope for is an Iron 2h, and I could also potentially get some pieces of steel armor. That's not all mud golems have to offer though...they also drop water staves, which could be useful for some spells. They also drop clay every drop, which is a convenient way for me to get a few crafting levels. There's a challenge with mud golems though: I need to buy a dynamite for each kill, which costs 50 GP each. For the first few kills, I sold off all of the unicorn horns and bear furs that I had collected, but then I realized that I could do sheep herder for 3k cash, so I did that. I was so excited! Finally, no more punching. They also drop Bronze 2h's, so getting an iron one was lucky. This is rewarding to watch. Hope you get some armor soon. Update #4: My next task is the dream: Mithril Golems! Some of their drops will be best in slot for me for a long time. Mithril chainbody and Mithril square shield are nice, but most importantly, they drop the Mithril 2h, which I don't think I can improve on until 40 slayer. A Mithril Mace! This has 5 more weapon aim than the Iron 2h, but 3 less weapon power. It doesn't drop me a max hit though, so it's better for now. Mithril Square shield! It's really coming together now. Mithril 2h! With 32 weaponaim and weaponpower, this thing dwarfs all the other weapon drops I've gotten. 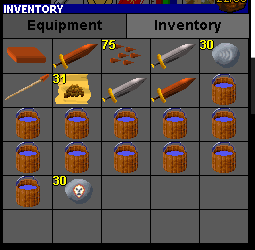 Still wanting to take advantage of my square shield, I swapped between the 2h and shield while finishing up the task. Mith golems are actually pretty tough, I could only kill 3-4 of them per trip. For my next task, I got yet another mud golem task. It's nice, but my cash stack is running out. I had to sell off a few of my mith golem drops to afford the dynamite. Thanks for reading everybody! This has been a lot of fun so far. Lots of good upgrades to your equipment. It is very enjoyable to see. Finally a use for those bronze spears! Well this is definitely an interesting way to make a painful-to-level-up skill extra challenging, props!